It could be all the wildfires and drought, the snowless-ski season, or the flowers blooming in New York City in February, or just that this past summer was hot as hell pretty much everywhere. Whatever the case, a new study concludes that most Americans believe that global warming is a real thing—and that people are causing it. 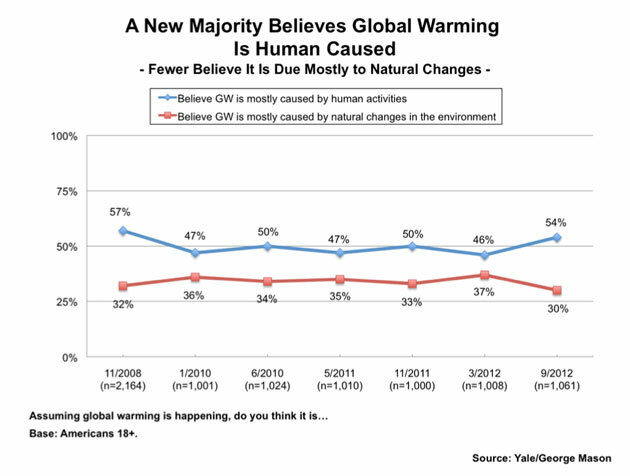 The study conducted by scientists from Yale and George Mason University shows that Americans’ belief in global warming has increased by 13 percentage points over the past two and a half years, from 57 percent in January 2010 to 70 percent in September 2012. At the same time, the number of Americans who say global warming is not happening has declined nearly by half, from 20 percent in January 2010 to 12 percent today. The report comes on the heels of recent poll results reported by Chris Mooney and discussed earlier this month at the Climate Desk’s Live Event, showing that Americans—and specifically undecided voters—are increasingly leaning green. Though the Yale/George Mason report draws no definite conclusions as to what could be clueing Americans in to the reality of climate change, the authors do say the record number of crazy weather events—not to mention the sticker shock of the disaster clean up costs—are likely bringing people around to the idea. • Those who believe global warming is happening are more certain than those who do not. More than half of Americans who believe global warming is happening (57 percent) say they are “very” (30 percent) or “extremely sure” (27 percent). • By contrast, for the first time since 2008, less than than 50 percent of the unconvinced are very (27 percent) or extremely sure of their view (15 percent), a decrease of 15 percentage points since March 2012. • Today more than half of Americans (58 percent) say they are “somewhat” or “very worried”—now at its highest level since November 2008. • Americans increasingly perceive global warming as a threat to themselves (42 percent, up 13 points since March 2012), their families (46 percent up 13 points), and/or people in their communities (48 percent, up 14 percentage points). • A growing number of Americans believe global warming is already harming people both at home and abroad. Four in ten say people around the world are being harmed right now by climate change (40 percent, up 8 percentage points since March 2012), while 36 percent say global warming is currently harming people in the United States (up 6 points since March). • Three out of four Americans (76 percent) say they trust climate scientists as a source of information about global warming, making them the most trusted source asked about in the survey.